Smartphones can’t get any bigger. Talking on today’s 5-inch-plus models borders on trying to hold a small tablet up to the side of your head. So what’s a phone manufacturer to do to differentiate its phones from all the others? Bend them! These new curved phones might seem gimmicky, but if early models catch on, they’ll become the next hot commodity. LG and Samsung are first to market with their curved mobile devices, the G Flex and the Galaxy Round, the latter of which is only available in South Korea. While we’re glad they’re not evangelizing even bigger phones, we’re still left pondering the practicality of a phone with a curve in it. 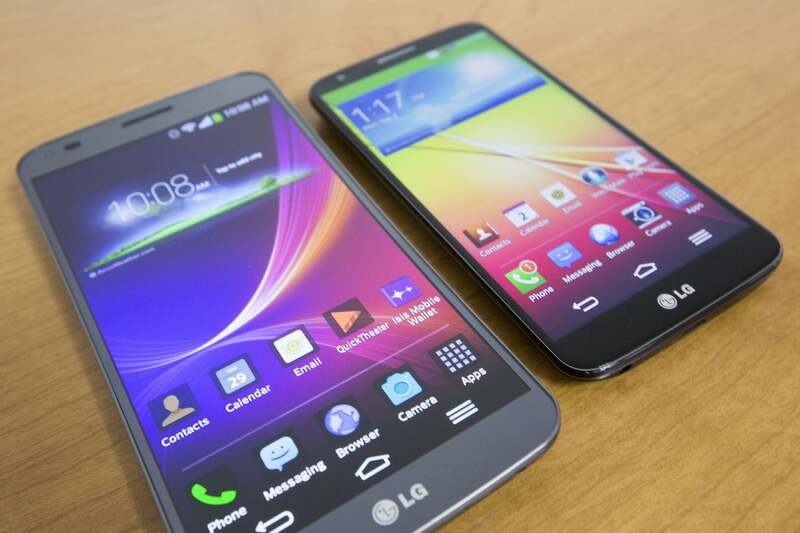 The LG G Flex (left) and the Samsung Galaxy Round (right). Samsung and LG are currently the only mobile manufacturers that sell smartphones with curved displays, and they have entirely different design approaches. LG’s 6-inch G flex is curved vertically, while Samsung’s 5.7-inch Galaxy Round is curved horizontally. Also, while both display components are technically flexible displays, they’re actually placed underneath a curved panel of glass. If you delve into the nitty gritty of specifications, you’ll notice that the Galaxy Round is basically a tuned-up version of Samsung’s phablet-sized Galaxy Note 3, while the G Flex is a rounder LG G2 smartphone, complete with volume and power buttons on the backside. Both displays are OLED. The G Flex, on the left, tends to stick out more than the G2, on the right. Remember what talking on the phone was like? Smartphones have been long advertised as app-based mini computers, with the voice functionality taking a backseat, but LG says it curved the G Flex specifically to fit the shape of the average person’s face—just like a regular phone. “The average length of a person’s cheek is 107.97mm,” wrote Kwan-woo Park, Team Leader for the G Flex Product Planning team, in an email interview. “We curved each end of the phone to suit this measurement and reduced the distance between one’s mouth to the microphone.” The bend in the phone also helps solves the problem that many large-sized phones have: being too big to talk on. Rather than position the mouthpiece against the side of the chin, which is what usually happens with a smartphone larger than 5.5-inches, the curved body is meant to help position the mouthpiece by your mouth. For comparison’s sake, the G Flex is 22mm longer than its predecessor, the G2. I held the G Flex up to make a call and while the bottom of the handset was technically closer to my mouth, it shot past my chin. It’s possible that my head size isn’t the one that LG intended for its handset, but the G2 felt much more comfortable to hold, regardless. The Samsung Galaxy Round, on the other hand, appears to have been designed for a better viewing experience. Some early reviews of the device mention that call quality is only sub-par, but it’s unclear if that’s because of its shape or because Samsung didn’t put much emphasis on that particular feature of the phone. LG’s G Flex (left) next to its G2 handset (right). Reflections from bright lights around you may prompt you to turn up the brightness on your screen, but by doing so you’re also using up more battery power. With less screen reflectance, you won’t have to worry so much about the ambient lighting around you, or have to crank up the brightness just to read a text message. The concave screen shape on the Galaxy Round cuts down on reflections from the surrounding ambient light two ways: first, by reducing the screen’s 180 degree opening angle, which eliminates reflections from some ambient light coming from the sides. Second, from specular mirror reflections off the concave screen, because the curvature directs reflected ambient light coming from behind away from the viewer’s line of sight. LG added that it also curved the display for a “more natural viewing experience” and the G Flex’s shape is meant to reduce glare and distortion. It certainly helps—I found it pleasurable to peruse my Instagram feed and read a Kindle ebook with the curved screen in a variety of lighting situations. But its screen is still glossy, and it doesn’t completely negate reflections—if there’s an overhead light up above you, you’ll still have to turn the phone so you’re not staring at a reflection of it. Samsung’s Galaxy Round is curved specifically to feel better in the palm of your hand. Kevin Costello, a Certified Professional Ergonomist (or CPE) and President of US Ergonomics, a firm that focuses on workplace ergonomics, hasn’t had a chance to use either of the devices himself, but he appreciates the new form factor. “If you look at an iPhone or a lot of these ‘bricks,’ they’re square, rectangular and the body is not necessarily square and rectangular.” Costello added that a device that is a little softer in appearance and is formed to fit the body more naturally offers some advantages, and “demonstrates some sensitivity to the fact that we’re not all robots.” Indeed, the G Flex felt more comfortable to type with two-handed, and despite its large size, wasn’t as difficult to grip as other large handsets. If they take off with consumers, those flexible displays are here to stay. LG has just launched the G Flex, and whether it takes off will depend entirely on the company’s marketing prowess and how consumers respond to the new form factor. Dr. Soneira believes that there is a future for those bent screens, after all, but that it will take awhile before they’re fully incorporated into the smartphone scene. “It’s clear that flexible displays will have a profound effect on the use of most display based products starting in the very near future,” he wrote in his blog post. “The display world isn’t flat anymore, and in a few years it won’t even have to be round.” We’ll have a review of the LG G Flex up soon, with our full analysis of what using a curved display is really like. 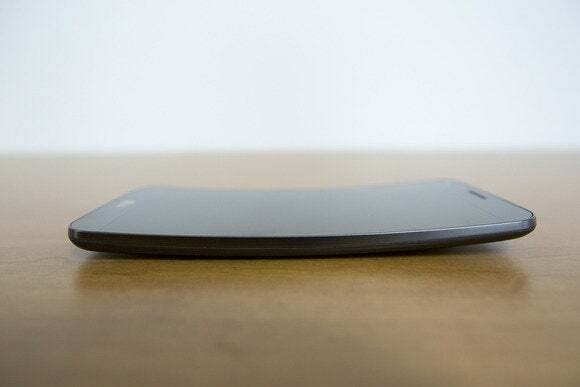 This story, "Curved smartphones: just a gimmick, or the next big thing?" was originally published by TechHive.